Considering how much we're getting screwed by high gas prices, dangerous oil & hydrocarbon gas drilling, it seems only appropriate that Exxon Mobil's $11 billion profit in just the first three months of 2011 represents a 69 percent increase from last year. Why Does Arlington Fight New Highways? Because Arlington (and DC, Fairfax, etc.) continues to get failing grades for air quality that can be linked directly to excessive pollution from cars, SUVs & trucks. 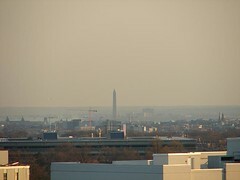 The American Lung Association gave DC and every Virginia suburb an F for ozone pollution. What effects can humans expect from ozone and other smog-inducing photochemical pollutants? Ground-level ozone, sulfur dioxide, nitrogen dioxide and carbon monoxide are especially harmful for senior citizens, children, and people with heart and lung conditions such as emphysema, bronchitis, and asthma. It can inflame breathing passages, decrease the lungs' working capacity, cause shortness of breath, pain when inhaling deeply, wheezing, and coughing. It can cause eye and nose irritation and it dries out the protective membranes of the nose and throat and interferes with the body's ability to fight infection, increasing susceptibility to illness. Hospital admissions and respiratory deaths often increase during periods when ozone levels are high. DC and Loudoun got Ds for particle pollution, while Arlington and Fairfax got Cs. And what does that mean for your health? [Particulate] pollution is estimated to cause 22,000-52,000 deaths per year in the United States (from 2000) and 200,000 deaths per year in Europe. The effects of inhaling particulate matter that have been widely studied in humans and animals now include asthma, lung cancer, cardiovascular issues, and premature death. Why does Arlington fight new highways and distant coal plants? To steal a line from Sen. Sheldon Whitehouse, in the contest between pollution and children's lungs, there's a case to be made that someone should be standing up for children's lungs. Of course, debates about air quality will be nothing more than hot air if Republicans on Capitol Hill succeed in gutting the Clean Air Act. Democrats and several moderate Republicans in the Senate have already beaten back several attacks, but please make sure your members of Congress know you support strong clean air protections. Cars pollute our air, leading to our nation's capital having one of the nation's highest asthma rates, particularly among children. Subsidized space for cars disproportionately benefits those who can afford cars in the first place and probably don't need a handout. And let's not forget that cars hit, in declining level of frequency, people, homes, and Rhodeside Grill. Bike sharing, on the other hand, leads to zero pollution or childhood asthma, takes up very little space, and is free for the first 30 minutes of each trip (though you do need a credit card to register). But somehow the Arlington Republican Party thinks cars are more in need of taxpayer support. As Matt Yglesias writes, ‎"It's all just a reminder that sincere devotion to free markets plays almost no role in economic policy debates. It's identity politics all the way down." Check out this Mark Fiore cartoon. Green Groups Giving Up Carrying The Torch For Carbon Pollution Limits? In yesterday's post on how we need a climate bill not just individual action on Earth Day, I wanted to include a link to email your member of Congress to ask them to pass clean energy & climate legislation. So I checked the website of the Sierra Club ... then Repower America ... then NRDC ... then the National Wildlife Federation ... then Greenpeace ... then Friends of the Earth ... and there could have been more ... before I finally found a climate bill action alert at the Environmental Defense Fund. I'm not saying there are definitely no climate bill email links at those groups' sites, but I couldn't find them with a few clicks & quick scanning. If national conservation organizations aren't going to keep talking about limiting carbon pollution, who will? I understand House Republicans aren't going to do much of anything that's positive on energy or environmental issues at all this year, never mind try to solve our biggest problems. When it comes to protecting public health & wildlife, we're playing defense this year, beating back attacks on the Clean Air Act & Clean Water Act. And after years of rallying around a climate bill, I can understand mixing in some other issues as well to keep people's eyes from going crossed. But what I don't understand is the conservation groups' continued focus on compromises like renewable energy standards. If we're in a political climate in which nothing is achievable, why focus on the achievable? If you're going into a negotiation and you know the other person's going to say no, why water down your ask? Why not ask for what you really want? The next milepost in this debate is January 2013. The House can only get more friendly to tackling the climate crisis, the Senate has about a 50/50 chance of staying where it is or getting friendlier, and President Obama is a good bet for reelection against a weak GOP field. Now is the time to push the reset button and set the goal for the debate after the 2012 election (there can be plenty of watering down after that). Where do conservation groups want the carbon pollution debate to start? A carbon tax? Cap and trade? Cap and dividend? In a dreary time, let's dream big. Via NRDC's Jessica Lass, check out this cool new website for making sure fruit doesn't go to waste, called FallenFruit.org. It has maps for cities in California, Colorado, Nevada and New Mexico, but nothing out east (yet). 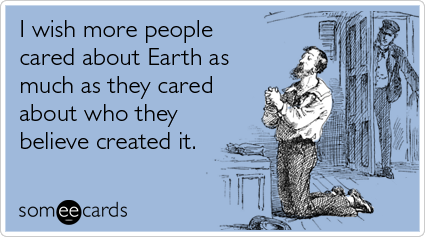 What's Earth Day 2011 about? Consuming! That's right, new AOL subsidiary Huffington Post declares, "There's no better way to celebrate the planet than with free goodies!" Because nothing says conservation like using more than you need. Shameless corporate co-opting aside, I'm cynical about Earth Day for one reason: No major environmental problem has ever been solved through voluntary individual action. Voluntary individual actions didn't solve DDT, water pollution, air pollution, ozone destruction, or acid rain - federal government action did. Right now, our biggest environmental challenge is our addiction to dirty fuels and all its destructive effects - a climate in crisis, polluted air and water, destruction of communities & habitats thanks to oil drilling & mountaintop removal, the list goes on. But on EarthDay.org, you have to make two clicks to get to anything about legislative action, and that's only an ask to sign a petition ... which feels more like it's about collecting your email address than driving action. What Earth Day CAN do is raise awareness, especially among Earth's newest residents, about our environmental challenges. You can join an event in Arlington on Saturday, or find an event near you at EarthDay.org. And there is one giveaway worth checking out - Capital Bikeshare is giving out bike maps & membership coupons in Rosslyn today. But none of that is a substitute for the concerted action needed to change our national policies and keep energy & environmental issues at the top of the political agenda. Sheraton Shares Savings With Guests Who Make "Green Choice"
UPDATE 6/16/11: Should've said this is a Starwood Hotels program, so you may find it at a Westin, a W Hotels, etc. 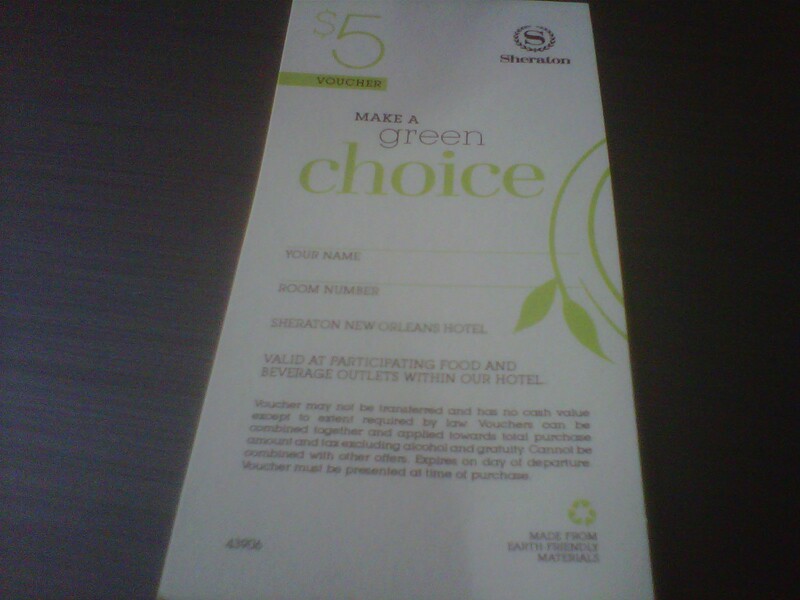 Forget 5 cent fees and rewards - Sheraton Hotels are putting some real weight behind their effort to get customers to buy in to conservation efforts. And since hotels can save big bucks on staff time and water costs if they don't have to strip and wash your still-clean sheets every night, why shouldn't conservation-conscious customers share in the savings? Worth noting that Sheraton has also been a leader in going smoke-free. I would show you a picture of the food I purchased with the vouchers, but it's long gone. After a long couple of days on Louisiana's Bay Jimmy, I was in no mood to conserve the freshly-fried fish in front of me. I'm in Louisiana this week for the National Wildlife Federation as the one-year mark of the Gulf oil disaster approaches. Here's my first post at NWF's blog. I wrote last year about how, by helping kill clean energy & climate legislation, politicians claiming to be on coal's side were actually helping accelerate coal's inevitable decline. Without a Congressional mandate to pretend "clean" coal is real and massive subsidies for technology research, coal wouldn't be able to compete against natural gas, solar and wind power. 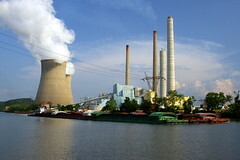 The U.S. Environmental Protection Agency (EPA) today announced a settlement with the Tennessee Valley Authority (TVA) to resolve alleged Clean Air Act violations at 11 of its coal-fired plants in Alabama, Kentucky, and Tennessee. The settlement will require TVA to invest a TVA estimated $3 to $5 billion on new and upgraded state-of-the-art pollution controls that will prevent approximately 1,200 to 3,000 premature deaths, 2,000 heart attacks and 21,000 cases of asthma attacks each year, resulting in up to $27 billion in annual health benefits. TVA will also invest $350 million on clean energy projects that will reduce pollution, save energy and protect public health and the environment. "This agreement will save lives and prevent billions of dollars in health costs. Modernizing these plants and encouraging clean energy innovation means better health protections and greater economic opportunities for the people living near TVA facilities,” said EPA Administrator Lisa P. Jackson. “Investments in pollution control equipment will keep hundreds of thousands of tons of harmful pollutants out of the air we breathe, and help create green job opportunities that will reduce pollution and improve energy efficiency." [Rockefeller] oddly refers to EPA’s “rush to regulate” greenhouse gases. Rush to regulate? Seriously? Come June, it will have been 23 years since Dr. James Hansen warned Congress that global warming was already underway … and with a GOP-controlled House, does Sen. Rockefeller really believe there’s much chance of a comprehensive climate change bill becoming law — or would the success of his EPA-blocking legislation just be a way to again protect coal from having to "embrace the future"? My only question is, why won't politicians like Barack Obama, Tim Kaine & Mark Warner level with voters that the age of coal is ending? Instead, we get lots of empty rhetoric about how "clean" coal will someday appear out of thin air. Do they really think voters can't handle the truth? [John] Reeder's vision, which he says is backed by Westover merchants, would start with 20 farmer-vendors on McKinley St., on the grounds and parking lots of the Reed School/Westover Library. He and 25 fellow enthusiasts foresee the market as being open on Sundays from 9 a.m. to 1 p.m., supervised by a new nonprofit created with civic associations. The newly renovated Reed, he says, was designed with a front plaza and sidewalks with just such a use in mind. This November, Reeder won verbal approval from the School Board, which has jurisdiction over the Reed property. But there's a snag. "The county zoning staff has indicated they will not issue a use permit until after an elaborate change in the county ordinance pertaining to farmers markets," Reeder says. Officials asked for detailed plans that require the blessing of school board and superintendent. "The staff told us it will likely not be till September or later this year before we could get a use permit," Reeder says. "That means essentially there will be no Westover farmers market in 2011." What, do you expect Arlington's zoning administrator to go rushing in blind to something as dangerous and controversial as (gasp!) a farmers market! Won't someone think of the children??? 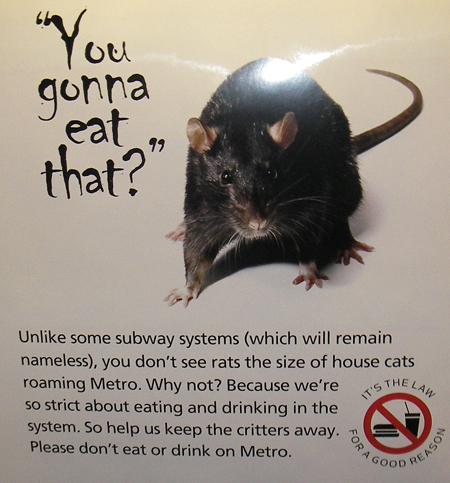 But Arlingtonians have asked for this type of hyper-restrictive regulation. At the same time Westover residents are shaking their heads at the regulatory maze to set up a simple farmers market, Lyon Village residents are asking for new ways to restrict parking on their streets. And while the project is finally moving forward, it took a concerted community effort to overcome citizen & County objections to the Westover Market Beer Garden. 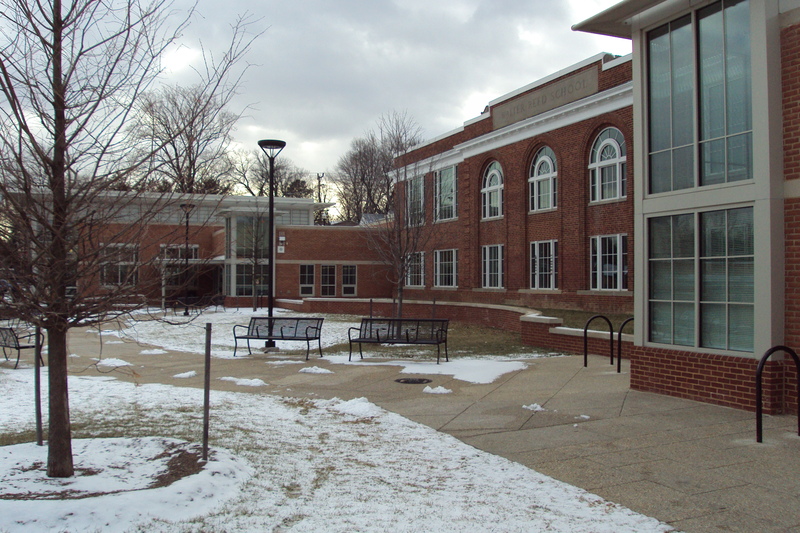 Look at the East Falls Church redevelopment plan and the top citizen complaints about the area - "Lacks unifying identify or central focus," "Has underused land and prevalent surface parking," "Lacks neighborhood-serving retail." Historically, Arlingtonians haven't see those as bugs - they were features. In 1986, EFC residents had the county create zoning bans on business or multifamily homes to keep those loud young people out of their neighborhood. And now 25 years later they're wondering why their neighborhood is boring and isolated. "God Seems To Will That The Creeks Rise A Bit More Often"
Via Andrew Sullivan, a great post on the impact of mountaintop removal on Appalachian communities. Since DC, Maryland and Virginia (well, mostly Virginia) can't get on the same page about a dedicated funding source for Metro, the transit agency continues to cut wherever it can. Most of the changes aren't visible to riders, like slashing funding for maintenance & long-term improvements. When Metro first opened, carpeting & padded seats were seen as a good investment to lure finicky DC commuters out of their cars. 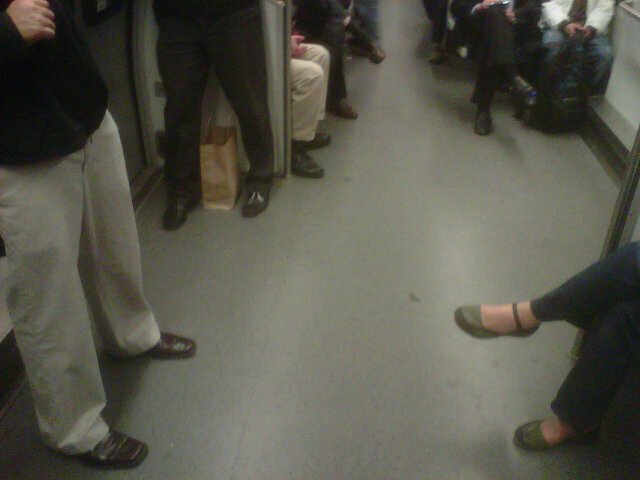 Now, the theory goes, Metro has plenty of customers and can scale back on the luxury items. I'm torn on the carpeting - while it does seem unnecessarily expensive, the car felt cold & barren without it. The fabric seats were a bit more alarming. How can I put this? I'd much rather my seat repel whatever was spilled on it rather than absorb it. Update 9:11am: Michael Perkins of GreaterGreaterWashington.org adds on Twitter, "I'm telling my grandkids how we used to run trains more than once/hr outside of peak of the peak of the peak of the peak time." But running trains more often, getting more people to work on time & getting more cars off the road would require raising taxes on Virginians each year by $1! SOCIALIST. DC's had an odd spring - stretches of cool, damp weather mixed with record highs. After Thurgood Marshall BWI Airport set a record high of 81 on March 18, Monday's forecast of 88 threatens the records of 91 at National, 87 at Dulles and 85 at BWI. Then we're right back down to lows in the 40s on Tuesday & Wednesday. Globally, the trend remains clear - NOAA's National Climatic Data Center reports January-February temperatures were 0.72 degrees F above the average for the 1900s. That means that the first 2 months of 2011 tied for the 17th-hottest on record. 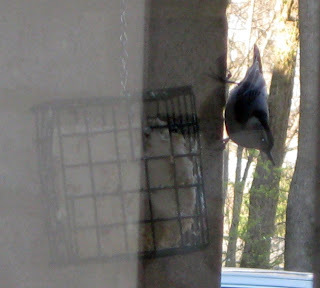 Why Do Bird Types Show Up at My Feeders in Twos? Interesting that I haven't been getting new species at my bird feeder one at a time - they've shown up in twos. 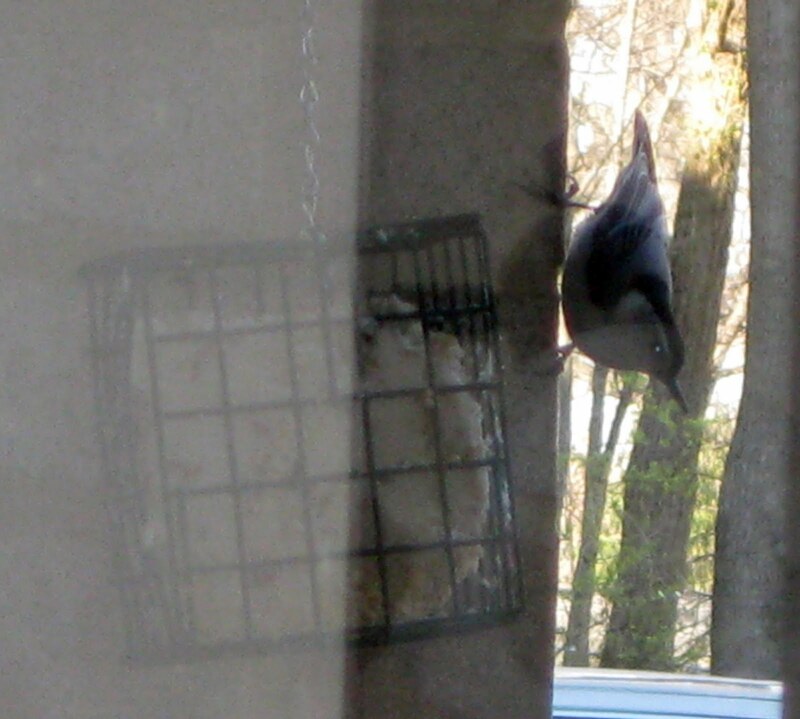 The tufted titmouse & Carolina chickadee made sense - similar habitats, similar feeding strategy, safety in numbers (especially given the toughs that hang out around here). While I've seen rabbits, hawks, and even a bald eagle in this area, I hear I haven't met some of the most interesting neighbors. A National Wildlife Federation coworker who lives in Arlington's Madison Manor tells me he regularly sees foxes ... and on trash night, has heard a coyote yipping in the darkness. 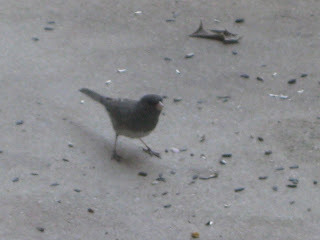 Read all my backyard birding posts under my birdwatching tag. 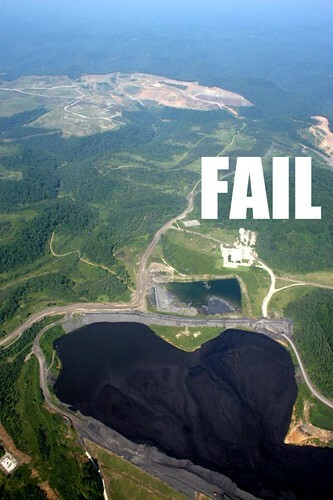 Will GOP Shut Down Government Over Mountaintop Removal Mining? "Curiously enough, mountaintop mining was put on the table late in the game. Who knew that was going to lead to the shutdown of the federal government?" Conrad said on CNN. Mountaintop removal mining relies on heavy explosives to blast off several hundred feet of mountain to expose coal seams, and has impacted over 500 mountains in West Virginia, Virginia, Kentucky and Tennessee to date. According to the EPA, the practice has also buried or destroyed more than 2,000 miles of streams in those states. Residents who live in proximity to mountaintop removal mine sites complain of orange and black tap water flowing from their faucets, breathing in coal dust floating in the air outside their homes and higher-than-normal cancer rates. I was in the beer aisle of Harris Teeter last night when a guy next to me in his 20s shook his head ruefully and said, "Man, I'd kill for some good, strong beer. Any chance you know anywhere like that around here?" "Absolutely," I said. "Go to Westover Market up on Washington Boulevard. Three of the four walls are packed with beer." His eyes lit up. "Is that far?" "Nah, about two miles from here," I told him. "Thanks!" he said, then spun around - and I am not making this up - and RAN DOWN THE BEER AISLE AND OUT OF THE STORE. Hey, when you need good beer, you need good beer. I tell this story only as an excuse to link to this ArlNow.com story updating the progress of Westover Market Beer Garden in clearing Arlington's regulatory hurdles. So far, so good! Going carbon-neutral definitely gets filed under genuinely green - other than switching to 100% renewable energy, I can't think of much that'd be higher on the green list. And this seems like a great example of an opportunity to use a legit environmental effort to differentiate your product in a category where brand loyalty probably isn't very high. I mean, if Skippy peanut butter goes carbon-neutral & you're a Jif man, you might not want to give up the taste that reminds you of mom's kitchen. 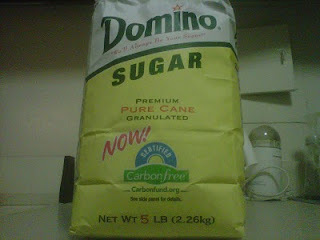 But I can't imagine anyone being like, "Screw you, Domino! I'll never leave Dixie Sugar! Do you hear me, Domino? Never!" Obviously the NYC subway is a much older system tasked with carrying a lot more people on a lot more lines that service a lot more stops and they're doing the best they can. But it was a good reminder that, for all the complaining, we have it pretty good here in the DC area. What's This Spring Been Like in DC? Imagine Seattle. Cold, gray, damp. Now take away the mountains. And the ocean. And the good music. Then make all the people really uptight. Oh, and add lots of tourists. Many of them riding Segways. That's DC in the spring of 2011. 33% DONE. Install delayed....please wait. Saturday Volunteer Event: Clean Off the 'Shed! The Alice Ferguson Foundation is organizing its annual Potomac River Watershed Cleanup on Saturday morning (April 9th) from 9am to noon. The Green Miles will be joining the Arlingtonians for a Clean Environment volunteer group at Glebe & Chain Bridge Road, you can RSVP on Facebook. There will be events along the Potomac in DC, Maryland and Virginia, so go to PotomacCleanup.org to find a project near you. Dominion is upgrading three power plants from coal to biomass & it's also moving forward with a study on the transmission of power generated by offshore wind. Read all the details from Lowell over at Blue Virginia. Richard Muller has been unconvinced so far by data pointing to a warming world. So he did his own study of temperatures, which revealed a definitive warming trend. Muller didn't hide his findings - he presented them to Congress this week. Richard Muller is a climate science skeptic. When Richard Muller initially announced his study, Anthony Watts hailed it as "good news." But when Muller's conclusions contradicted Watts' political beliefs, Watts ripped Muller as someone with an "agenda" and "an axe to grind". Anthony Watts is a global warming denier. What do new coal-fired power plants deliver 100% of? Their admitted emissions. Virginia's new coal-fired power plant in Wise County is projected to emit 4.8 million tons of carbon dioxide, 4,132 tons of carbon monoxide, 604 tons of sulfur dioxide, 1,920 tons of nitrogen oxides, 329 tons of particulate matter, 139 tons of volatile organic compounds, and 5 pounds of mercury. Every single year it's in operation.